We are working on several projects concurrently in our lab. A few of these are described below, but if you have an idea that you are keen on exploring using my lab, please contact me to discuss! We heartily welcome students pursuing their BA, BS, and MS degrees, as well as post-doctoral scholars to join us. If you plan to apply to the graduate program at Plymouth State University, you may do so here. 1. Understanding the diversity of genus Boechera (Brassicaceae) in the Basin and Range Province of Nevada. This massive North American genus (ca. 72 sexual diploids and 40 obligate apomict triploids) possesses many useful morphological characteristics for species circumscription, but needs careful study. Tommy Stoughton has been collecting and identifying Boechera for many years, so this research primarily involves identifying characteristics (many of them microscopic!) for distinguishing Boechera species, but also requires molecular systematic research and field collecting. 2. Montane Mexico and Central America as harbors of genetic diversity for northern lineages: a case study using genus Chimaphila (Prince’s Pine, Pipsissewa). Several plant taxa have an unusual, disjunct geographic distribution between Mexico and Eastern North America. This project is an investigation of the phylogenetic relationships among the eastern C. maculata, several Mexican and Central American taxa described by Per Axel Rydberg in the early 1900’s, the western C. menziesii, and the widespread C. umbellata s.l. Research involves field collecting, RAD sequencing and analysis, and phylogeographic estimation. With this study, we will evaluate the role of Central American and Mexican highlands in harboring genetic diversity of north temperate lineages through glacial & interglacial cycles. Important for conservation! 3. The Spring Beauty Pageant: phylogenomics and morphological evolution of genus Claytonia (Montiaceae). Using Tommy Stoughton’s dissertation research on western Spring Beauties as a starting place, this research is a scale-up involving plastome assembly and analysis to identify phylogenetically informative loci, leaf morphometric analyses, and much, much more. Research on this economically important genus has been expanding to include the eastern species, C. caroliniana and C. virginica, and their diversification in response to changes in climate over time. 5. Reproductive isolation of the mycoheterotrophic Pyrola picta and P. aphylla (Ericaceae) and the functional consequences of hybridization. This research is an extension of Diana Jolles’ dissertation research on the P. picta species complex of western North America. Pyrola aphylla Smith is an obligate mycoheterotroph and is lacking in fully expanded leaves and chlorophyll. However, P. aphylla hybridizes with a closely-related species, P. picta, at very low frequencies in sympatry. This project uses RAD sequencing and genome skim data to investigate patterns of gene flow in sympatric populations (largely Northern Californian) and elucidate how interspecific hybridization influences plastome content and function. 6. Taxonomic circumscription of the Silene verecunda species complex (Caryophyllaceae) of western North America. This species has more than six subordinate taxa associated with it, but has seemingly undergone very little genetic diversification. In 2014, Stoughton et al. described a new species of Silene belonging to this group, but there is still much work to be done! 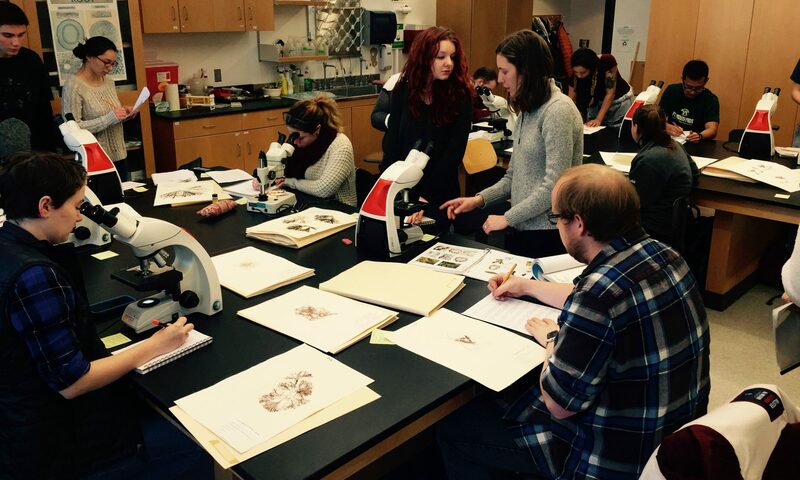 Our research involves examining herbarium specimens for distinguishing morphological and micromorphological characteristics, common garden studies in the PSU greenhouse, and studies of reproductive compatibility. 7. Host specificity and lineage diversification in Inonotus obliquus, the chaga fungus. Inonotus obliquus is a sclerotium-forming, parasitic fungus that grows circumboreally in birch forests. This species has been observed growing on species in the Salicaceae, Fagaceae, and Betulaceae, but in New England is is mainly found on yellow birch (Betula alleghaniensis) and white birch (Betula papyrifera). We are interested in whether chaga fungi growing on different Betula species in New England are host specialists belonging to distinct lineages, or whether they are wide-ranging host generalists. In addition to genetic analyses, we are quantifying several chemical constituents of our chaga samples to determine whether host tree species influences the types and quantities of bioactive, possibly medicinal, compounds produced.